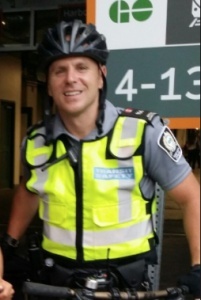 Special Constable Brenton Hoffman has been a Peace Officer with GO Transit in Toronto for seven years. Brenton is currently on the Bike Patrol Unit covering Union Station, train layover yards, GO Stations, parking lots and train tracks that are generally inaccessible by vehicles. Special Constables are responsible for ensuring the safety and security of thousands of passengers every year, enforcing laws and by-laws, providing customer assistance and supporting local police, fire and ambulance. They also help promote railway safety and have the authority to enforce other laws under police powers such as the Criminal Code, Controlled Drugs and Substances Act, the Youth Criminal Justice Act, Safe Streets Act, Liquor Licence Act, Mental Health Act and Trespass to Property Act. Brenton gained valuable law enforcement experience while previously holding positions as a Sheriff with Alberta Sheriff’s Department in Edmonton and as an Armed Nuclear Response Force Security Officer at Ontario Power Generation at the Pickering Nuclear Facility. The 2016 ride will mark the second time Brenton has taken part in the four-day event. Always a cycling enthusiast, Brenton has been has been commuting by bike in all seasons, to and from work since graduating from college. 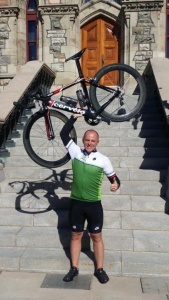 But it wasn’t until February 2015, when he saw a story about the Ride to Remember that he really started taking long distance cycling seriously. 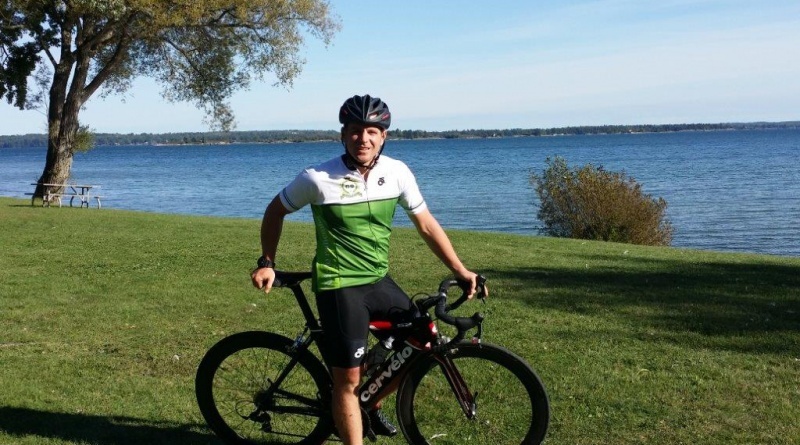 He reached out to the Ride’s coordinator at the time, Niagara Regional Police Services Sergeant Shawn Briggs, and was quick to sign up after their discussion. Right at the beginning of his career with GO Transit, the day he was granted the authority as a Special Constable to apprehend people under the Mental Health Act, Brenton responded to a report of a female walking on live train tracks. The female was emotionally distraught and without regard for his own safety, Brenton entered the railway and was able to apprehend the combative female, preventing serious, if not, fatal injuries. On a personal note, Brenton has represented Team Canada in the World Tug-of-War Championships in Blackpool, England in 2000 and in Pretoria, South Africa in 2002. He also competed across Ontario and the United States with The Bluewater Tug Of War Team for five years. Brenton also has a passion for stair climbing and competes in the CN Tower Stair Climb twice a year, climbing 144 flights, 1,776 steps, and routinely finishing in the top 10 rankings for fastest time up the tower.